See the human body in a whole new light. Reserve your bodies exhibit passes online today. This experience is mind boggling, and educational at the same time. 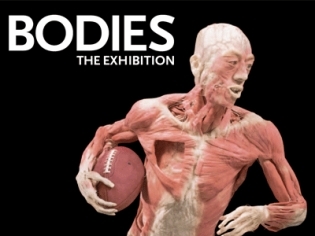 Bodies… The Exhibition at the Luxor Hotel and Casino offers the chance of a lifetime to see this world-renowned exhibit. Through state-of-the-art science, using the Polymer Preservation Process, the bodies have the ability to be on display while the audience gets an up close and personal look inside the human body. See displays of the circulatory system, the muscular system and even the digestive system. It is a learning experience for all ages and a lesson in anatomy that will not bore you to tears but instead will excite and entice. Make sure to purchase your tickets at least one day in advance because they sell out quickly. An audio tour option is available to add on with your ticket for $6. The graphics were great and at time points, slightly disturbing. The show is sort of short for the money. It teaches you a lot about the inner human body. It’s a learning experience for sure. I probably wouldn’t see it again in the future. The exhibit was gross but fun. I really liked the amount of information that was provided to us. I really learned a lot. I was just there yesterday. Thought It would be great but it really sucked and very short. Would not recommend it at all. What can I say. Seeing real body parts was a bit disgusting but totally fascinating !! Amazing and totally worth every cent. Seriously…amazing, graphic and somewhat disturbing. I would definitely recommend this exhibit. It will stick with you for years to come. It’s marvelous! you must see this! I can see the unbelievable inner world of human body! One of the top three exhibitions I have seen in my life. Not for the faint of heart. I have been wanting to see this for years ! Finally I got to and it was great! I hated all the reading I had to do, last thing I wanted to do on my vacation, but learned some new facts about the human body. A lot of stuff that turned my stomach, but best way to learn is from real human body. Human body skin was freaky so was the human sliced in pieces. You wouldn’t want to eat after that, but I definitely recommend this exhibition.